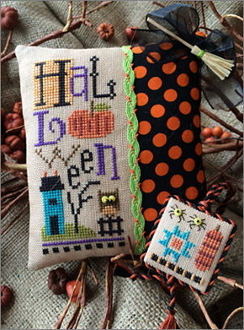 An adorable Halloween design by Lizzie Kate. Kit contains: 28 ct. Amber linen for pillow, Orange/black polka dot fabric for pillow finishing, green/orange rick rack for pillow finishing, 2 sets of googly eyes (1 for pillow, 1 for fob), Complete finishing instructions for pillow and fob You supply a bit of fabric from your stash for the bitty fob. Finished design: 2.25" x 5.25" ﻿ with a stitch count of 30W x 72H.